Only 10 minutes from Mapua by ferry, Rabbit Island offers shady lanes or breathtaking views of the beach. 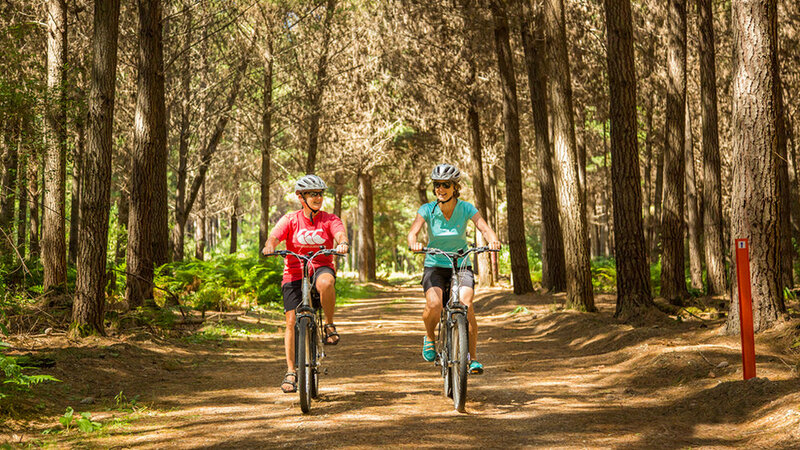 Inland cycling shows you a different face of the region if you have only a short time available for your tour. Winding through different landscapes on its journey between Mapua and Kaiteriteri. Enjoy sections of The Great Taste Trail and then go off trail to quiet country back roads. Allow us to take you to places most people don’t know exist. Experience the tranquility of the countryside, hop gardens, vineyards, orchards, majestic rivers, with a stunning backdrop of Kahurangi National Park. Many of our routes also pass wineries as well as artisans studios and galleries. All this and yet never too far away from a coffee stop! This tour can give you a real flavour of the area. day 3 Mahana and Moutere winery route (25 – 37kms). The Old Post Office in Upper Moutere is crammed full of local artists and makers' work as well as locally produced food products - excellent coffee too! By contrast, the beach at Rabbit Island is often completely empty. You arrive there by wooded flat trails and step out onto a wide open sandy beach. Enjoy shaded back roads and quiet riverside rides. • Route maps and bespoke route notes to help you discover hidden gems and other places of interest. • Airport pick up and drop off if you want your tour to start or finish at the airport. Price: From $475 per person. Solo traveller and children under 12 POA. Discounts available for larger groups (more than 6 people). Prices are per person based on two people sharing, with 2 days self-guided rides. as an extra day or it can replace a cycling day. Cruise, walk and/or kayaking combinations available. Price: From $295 per person. Solo traveller and children under 12 POA. Discounts available for larger groups (more than 6 people). extra day or it can replace a cycling day. Cruise, walk and/or kayaking combinations are available. Thank you for the wonderful experience you put together for us when we recently visited Nelson.